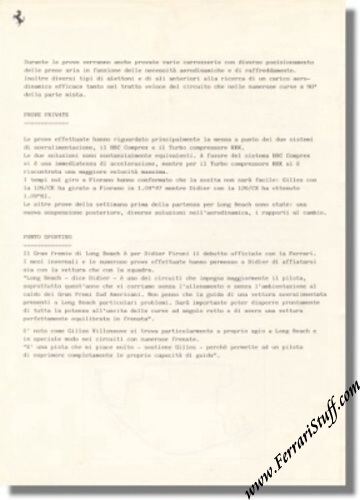 Vintage 1981 Ferrari press release on the Grand Prix of the USA held at Long beach. Mentions that Gilles Villeneuve and Didier Pironi will be driving the Ferrari 126/CX with BBC Comprex Supercharger while the spare car (as it was called back then) is a 126/CK with KKK Turbo Compressor. Contains quotes by Mauro Forghieri and sections on "Private Testing" and "Sporting Point". 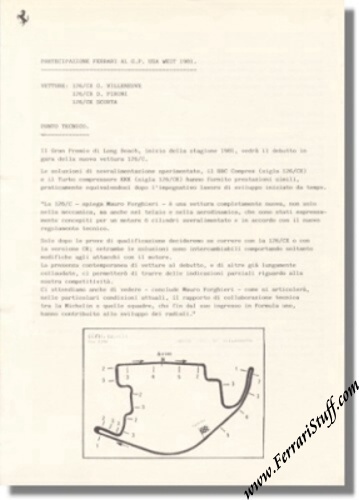 Also shows a map of the Long beach track with the gear shifting points. This was the race in which Didier Pironi made his debut in a Ferrari F1 car! Both gentlemen did NOT finish the race. Didier Pironi had to give up in lap 67 with fuel system trouble.